Over 300 former employees of a Foxconn Xbox 360 manufacturing plant in China threatened to commit mass suicide over missing compensation. 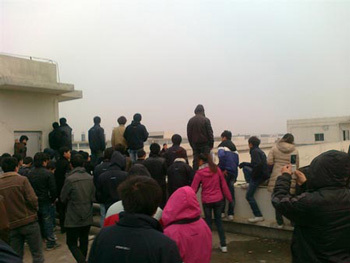 According to Chinese anti-government website, China Jasmine Revolution, the former employees at the plant in Wuhan, China, threatened to throw themselves off a rooftop, apparently after Foxconn refused to pay them severance compensation. On January 2nd the workers asked Foxconn for a raise. The company refused to increase their pay, but allegedly told the workers they could quit, and would receive compensation for doing so. The majority of the workers chose to quit, but the agreement was apparently terminated soon after, and the promised compensation never arrived. Fortunately, the situation was defused by the mayor of Wuhan, who managed to talk the enraged workers down. Foxconn made the headlines throughout 2010 and 2011 due to a series of suicides amongst its workforce, prompting an investigation into the working conditions at its massive, city-sized plants. Foxconn reportedly required employees to sign an agreement stating they wouldn't try to off themselves, then finally gave up altogether and decided to replace the workers with robots.